How do I change the Mac computer name, host name and NetBIOS-name? 96. How does Thunderbird autoconfig work? See also: How I do send mail from multiple e-mail addresses in Thunderbird? Thre is an autoconfiguration feature in Thunderbird in order to make it easier for the users to set up their mail accounts. Read more at Autoconfiguration in Thunderbird at the Mozilla web docs. 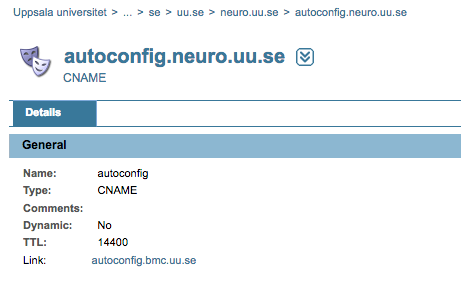 BMC-IT has a server at autoconfig.bmc.uu.se. To configure the feature for your domain at the university just add the following to your zone.